WHATEVER one thinks of the “new” South Africa, it is probably better than any possible outcome from the civil conflict that ended in 1994. 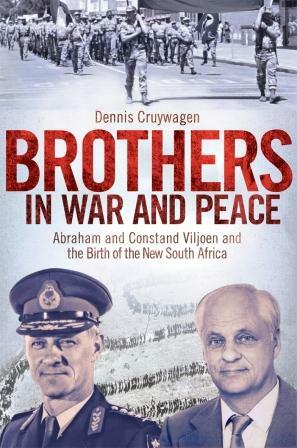 “Brothers in War and Peace” by Dennis Cruywagen claims to tell the story of how ‘two brothers’ helped prevent another civil war that would have begun in 1994. While Constand Viljoen was chief of the SA Army and later the SA Defense Force, it appears he had an identical twin, Abraham, who had been excluded from the Afrikaner establishment for his opposition to the apartheid heresy and his view of Christianity as a non-racial religion. Constand, although battle-hardened, “maintained a professional ethic that civilian casualties be minimised”. Abraham, on the other hand, though ‘theologically nonracial’, was prepared to participate in the “whites-only” electoral system, albeit in opposition to the ruling party. The brothers had little contact during those years, but after Constand’s retirement in 1985, and Abraham’s failure as a liberal politician in 1987, the two became involved on opposite sides of the negotiations surrounding the end of apartheid: Constand was increasingly looked to for leadership by right-wingers who mistrusted the reformist tendencies within the National Party, initially under P.W. Botha and then under F.W. De Klerk. Abraham worked for IDASA, which facilitated dialogue between, “white” South Africans from across the board, and the exiled ANC on the other. By surmounting the divide between these two groups, Abraham helped bridge the gap between the ANC and the right wing — in secret negotiations parallel to those between the ANC and De Klerk’s government. Researcher Dennis Cruywagen, who interviewed both (and many other characters featured) refers to these as the “real” negotiations, as their outcome was less certain than that of the official round. Fascinating details emerge: the potential conflict could have been far worse than a purely racial war, since it appears General Meiring, then SADF head, had evidently told ex-General Viljoen that his forces were prepared to use ‘all the force at their disposal’ against any rebellion, while on the other, Savimbi’s UNITA and assorted bantustan armies and militias were ready to lend assistance to rebels. Despite the negotiations, Viljoen and his colleagues, including ex-32Bn commander Jan Breytenbach, were also ‘fully prepared for war’, until their undisciplined allies, the far-right AWB, launched a disastrous intervention in Bophutatswana. This preview of potential countrywide chaos made Viljoen take the path of electoral politics, and once he did, the right wing as a whole settled down to make the best of the new situation. With these words, he crossed the line between indecision and resolve; between being a Machiavelli who pushed his people into war and a hero who saved them from one; between infamy and respect. The time for playing games was over. In an instant, it was as if he had been transported to the battlefield, where the commanding officer does not ask subordinates what course of action to take. He became the general, the decision-maker thousands of South African soldiers were proud of. He was self-assured and in charge, the chief who had led the SADF with distinction. He was once again General Constand Viljoen, leading from the front. The decision alone did not guarantee participation. The final, irrevocable commitment would be to hand in a list of candidates at the IEC that very night. Once that was done, there would be no turning back. ‘Take the candidates list to the IEC,’ said Constand. The final list was entrusted to Pieter Groenewald, who drove off to seal the Freedom Front’s fate. The divorce with Hartzenberg was final. It had been a week since Constand had registered the FF as a political party. As former Labour Party leader and British prime minister Harold Wilson once famously said, a week is a long time in politics. The general had just discovered how right he was. As with the registration, the Freedom Front’s candidates submission dominated the news the following day. ‘Poll: Viljoen says yes’, read the headline in the Pretoria News. ‘General Constand Viljoen has restored hope to a threatened election process by shattering the last remnants of the Freedom Alliance and confirming his registration of the Vryheidsfront,’ wrote reporters Dale Lautenbach and Robert Brand. Not only was it good news to a country nervous about the possibility of civil war, but it was also music to Nelson Mandela’s ears. Buoyed and grateful to Constand for turning his back on violence, Mandela said any subsequent disturbances caused by the right wing would now simply be a matter for the police.